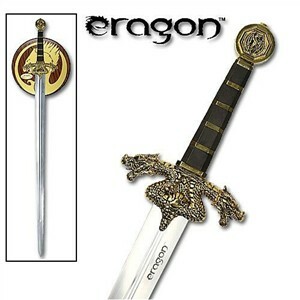 The Sword of Galbatorix recreates the battle sword of the evil Dragon Rider King from the story Eragon. Beginning as the first literary effort of a fifteen-year-old author, the epic story of Eragon progressed from daydream to self-published book and eventually to a well-known mainstream fantasy novel and movie. This reproduction of the sword of Galbatorix matches the details of the blade shown in the 20th Century Fox movie directed by Stephen Fangmeier. Though the movie fared badly with reviewers, the story itself has been compared to Star Wars and The Lord of the Rings. Fans of the epic tale of the farm boy who becomes a vengeful but honorable dragon knight should be pleased with this massive sword -- the weapon of a young king who turned to the side of evil when his beloved dragon mount met an untimely end. Fifty inches in overall length, the sword's blade is high carbon stainless steel fullered with a central blood groove. The sword's double edges are ground and polished but not sharpened. Pommel and handguard are ornate cast metal with gold-like plating -- the handguard is finely detailed with dragon-heads as crossbars and a dragon scale motif. The grip of polished hardwood is divided by polished metal spacers. The Galbatorix sword comes with a leather-bound scabbard with fittings of the same gold-toned metal as the sword. The set also includes a polished wooden plaque for wall display and a certificate of authenticity.